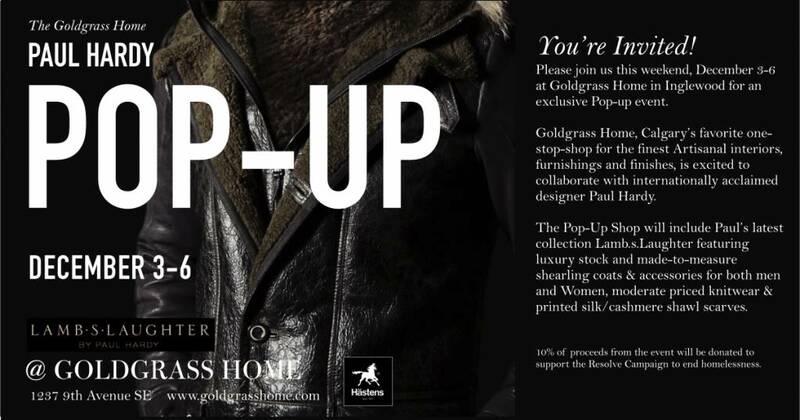 This weekend only, Goldgrass home welcomes internationally acclaimed designer Paul Hardy for an exclusive Pop-up event. The pop-up shop will include Paul Hardy’s latest collection, Lamb.s.Laughter, featuring luxury stock and made-to-measure shearling coats & accessories for both men and women, moderate priced knitwear & printed silk/cashmere shawl scarves. This is an awesome opportunity for you to come down and see the collection, and even set up a private, made-to-measure fitting at Paul’s studio. If you’re not familiar with Paul’s work, you should know that he is one of Canada’s top talents, having been featured in top design publications, and regularly showing his work in New York, Paris and Milan. If you are familiar, then you understand why we are excited and honored that Paul has chosen us as a location for this Pop-up. What you might not know is that Paul has also started a venture into home and interior style. This work has not yet been widely published, but he has shown me some early photos, and it’s clear that his unique talents translate wonderfully into this new medium. We certainly can’t wait to see what he can do using some of our artisanal furnishings and finishes in his designs! We’re also running a campaign this season to help raise funds for Resolve. They are a great local cause, bringing together many different groups in an effort to end homelessness. 10% of the proceeds from the event will be donated to Resolve. And be sure to follow along with our ’25 Days of Giving’ for more ways to take part in the Giving Feeling!